Woodland in Belianske Tatras in Slovakia. Woodland i/ˈwʊdlənd/ is a low-density forest forming open habitats with plenty of sunlight and limited shade. Woodlands may support an understory of shrubs and herbaceous plants including grasses. Woodland may form a transition to shrubland under drier conditions or during early stages of primary or secondary succession. Higher density areas of trees with a largely closed canopy that provides extensive and nearly continuous shade are referred to as forests. Conservationists have worked hard to preserve woodlands, because people are destroying animals habitats when building homes and other buildings. For example, the woodlands in Northwest Indiana have been preserved as part of the Indiana Dunes. Woodland is used in British woodland management to mean tree-covered areas which arose naturally and which are then managed, while forest is usually used in the British Isles to describe plantations, usually more extensive, or hunting Forests, which are a land use with a legal definition and may not be wooded at all. The term "ancient woodland" is used in British nature conservation to refer to any wooded land that has existed since 1600, and often (though not always) for thousands of years, since the last Ice Age (equivalent to the American term old-growth forest). 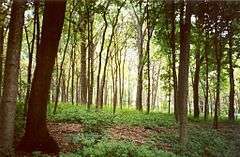 Woodlot is a closely related American term, which refers to a stand of trees generally used for firewood. While woodlots often technically have closed canopies, they are so small that light penetration from the edge makes them ecologically closer to woodland than forest. 1 2 Rackham, Oliver (2006). Woodlands (New Naturalist 100). London: HarperCollins. ISBN 9780007202447.